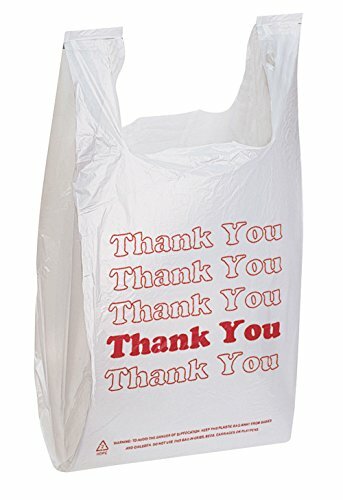 Plastic Thank You T-Shirt Bag feature red & white "Thank You" print. This bag is a wonderful way to show your customers that you appreciate their business! Made from durable plastic, and available in standard supermarket size, it fits perfectly into a bagging stand or jack for quick and easy use. The "Thank You" Plastic T-Shirt Bag is an economical retail packaging solution. These plastic bags are great for a variety of uses and are durable. All thank you bags are 11 " x 6" x 21" in size. Glossy purple and teal blue low density, plastic merchandise bags perfect for retail, trade shows, garage sales, goodie bags for party or weddings. Total of 100 retail merchandise bags with handles - 50 purple and 50 teal blue glossy shopping bags with handles (die-cut), 12"x15", No Gusset, Strong 1.25 Gauge. Low density Retail shopping bags, strong and durable, and the die-cut carrying handle makes them very user-friendly. Reusable shopping bags, recyclable and made with regular low-density plastic material. Buy now because you care about your customers and want them to have a memorable shopping experience. ACME puts customer satisfaction above everything else. If you are not satisfied with your products, you will receive a full product refund, no questions asked. Thank you so much for choosing ACME. We very much appreciate your business and hope that we can continued to provide for your needs in the future. Our colorful glossy merchandise bags are great for small gifts, goodie bags,candies,books, DVD's, reading material,clothing,jewelry,novelties,accessories,store supplies,exhibitions and trade shows. 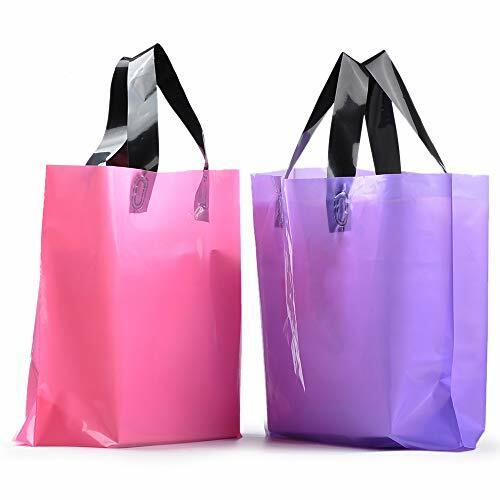 These shopping bags with handles are also perfect for return gifts, party favors,garage sales, kid's parties, salons, boutiques,convenient shops, retail stores, specialty stores and all occasions and giveaways. If our service was good and you were happy with the bags we would very much appreciate you let our future customers by rating our performance. Our customers are the most important component of our business and again thank you, we appreciate you. ACME Bag Bros provides quality merchandise bags, plastic merchandise bags, high density merchandise bags, retail merchandise bags. COMFORTABLE AND EASY TO USE: 100 MERCHANDISE BAGS WITH HANDLES - 50 teal and 50 purple glossy retail merchandise bags, with die-cut handles, 12x15"
BEST VALUE WITH 100% SATISFACTION MONEY BACK GUARANTEE AND 24 HOUR CUSTOMER SERVICE; WE WILL BEAT ANY COMPETITOR'S PRICE! HIGH QUALITY, DURABLE LDPE, 1.25 Gauge, No Gusset, 100% RECYCLABLE, REUSABLE AND ECO-FRIENDLY. 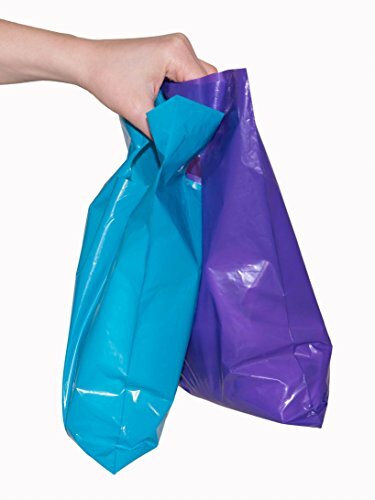 200 glossy purple and teal merchandise bags, retail shopping bags with handles retail or home & kitchen, 9" x 12"
Purple and teal low density, plastic merchandise bags perfect for retail, trade shows, garage sales, goodie bags for parties or weddings. Total of 200 Bags - 100 purple and 100 teal Merchandise Bags with Die Cut Handles, 9"x12", No Gusset, Strong 1.25 Gauge. Low density Retail Shopping Bags, strong and durable, and the die-cut carrying handle makes them very user-friendly. Reusable shopping bags, recyclable and made with regular low density plastic material. ACME puts customer satisfaction above everything else. If you are not satisfied with your products, you will receive a full product refund (not incl. shipping), no questions asked. Shop ACME Bag Bros for the best in shopping & Merchandise bags, T-Shirt bags, plastic merchandise bags, high density merchandise bags, retail merchandise bags. 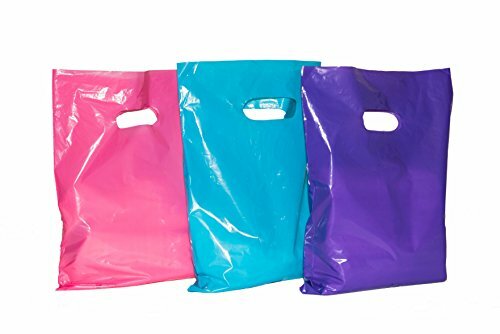 BEST LOOKING COLORS ON THE MARKET AND EASY TO USE: 200 MERCHANDISE BAGS WITH HANDLES - 100 purple and 100 teal glossy retail merchandise bags, with die-cut handles, 9"x12"
STRONG AND DURABLE, BEAUTIFULLY COLORFUL retail merchandise plastic shopping bags for smaller items. MADE IN HONG KONG (these are not the cheap Chinese bags of our competitors). 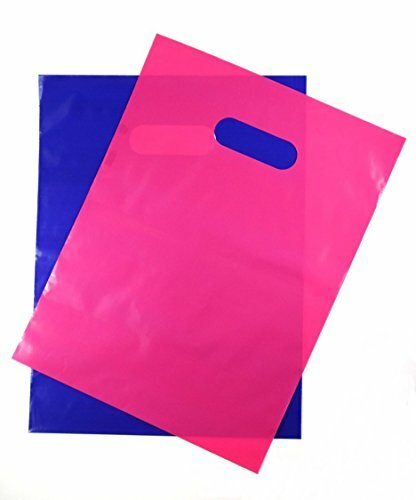 150 Purple, pink and teal blue combo wholesale merchandise bags, plastic bags with handles for retail or home & kitchen, 12" x 15"
Pink and teal blue low density, plastic retail bags perfect for retail, trade shows, garage sales, goodie bags for party or weddings. Total of 150 Bags - 50 purple, 50 pink and 50 teal blue Merchandise Bags with Die Cut Handles, 12"x15", No Gusset, Strong 1.25 Gauge. Low density Retail Shopping Bags, strong and durable, and the die-cut carrying handle makes them very user-friendly. Reusable shopping bags, recyclable and made with regular low density plastic material. These are not those cheap bags from China. ACME Bag Bros provides quality manufactured merchandise bags, plastic merchandise bags, high density merchandise bags, retail merchandise bags. BEST LOOKING MERCHANDISE BAGS ON THE MARKET AND EASY TO USE: 150 MERCHANDISE BAGS WITH HANDLES - 50 purple, 50 pink and 50 teal glossy retail merchandise bags, with die-cut handles, 12"x15"
HIGH QUALITY, DURABLE LDPE PLASTIC BAGS WITH HANDLES, 1.25 Gauge, No Gusset, 100% RECYCLABLE, REUSABLE AND ECO-FRIENDLY. BEST PRICE WITH 100% SATISFACTION MONEY BACK GUARANTEE AND 24 HOUR CUSTOMER SERVICE; WE WILL BEAT ANY COMPETITOR'S PRICE! STRONG AND DURABLE, BEAUTIFULLY COLORFUL retail merchandise plastic shopping bags for smaller items. MADE IN INDIA (these are not the cheap Chinese bags of our competitors). Low cost, durable welded construction, non-woven material for indoor and outdoor use, and colors won't run! Pack It Up Experience Having experience working with many retailers, we have learned a great deal of knowledge regarding the importance of CUSTOMER APPEAL. As a retailer, you obviously want consumers to purchase your product, but the BAG you give them to hold that product within says plenty about how much VALUE you give to your product. A bag should be so PERFECTLY constructed that one continues to use it even after serving its purpose. Think about how many times you yourself have reused a bag for other purposes that once was given to you for simply carrying a product. These users are thinking about your store/party/booth and even YOU to some extent when reusing these bags. Still don't think they hold VALUE? We came to Amazon already selling and getting feedback from local retailers in our area. Our bags are made FOR retailers and BY retailers. PREMIUM 200 PURPLE & PINK MERCHANDISE BAGS PACKAGE: Need bags you can rely on? These elegant bags are quite impressive. While the glossy shine will catch everyone's attention, these bags are not looking to make any compromises with overall quality. Each bag is made with superior material, which will get you multiple uses from each bag before needing to be discarded. At Pack It Up quality matters! You've heard that old saying, "you get what you pay for". Our comment to that is a simple.... AMEN! GREAT FOR SMALL RETAILERS AND CORNER SHOPS: These eye-catching bags are very handy for containing free samples, promotional goods, craft fair items, party favors, medical supplies, yard sales, books, documents, clothing, jewelry, multimedia, light groceries, trick or treating, disposing of trash from small receptacles, and so much more. IDEAL 1.75 MIL THICKNESS- This is the IDEAL thickness when it comes to glossy bags so no compromises are made on the overall flexibility of the bags. After all, you did want to purchase bags and not something with a hard unfoldable material. We learned from the mistakes of others! NOTICE that these are not your typical 1.25 mil bags, but rather ones that are aligned perfectly to provide the highest quality along with the best flexibility. COMFORTABLE DIE CUT HANDLE: Each bag is equipped to provide exceptional comfort by using a die cut handle. This feature eliminates sharp edges around the handle, which can result in a more comfortable shopping experience for many consumers. Many areas around the handle begin THINNING and eventually TEARING for the cheaper bags, but rest assured these can be comfortably held for as long as you'd like without having to worry about it thinning or tearing. ECO-FRIENDLY: 100% Recyclable and Reusable: We care for the environment and to show our gratitude to mother earth we strive to keep it protected. Additionally, the glossy material allow these bags to be easily CLEANED and REUSED. 300 count thank you bags, easy to use, good for many occasions. White color, color may be vary due to different light and displays. 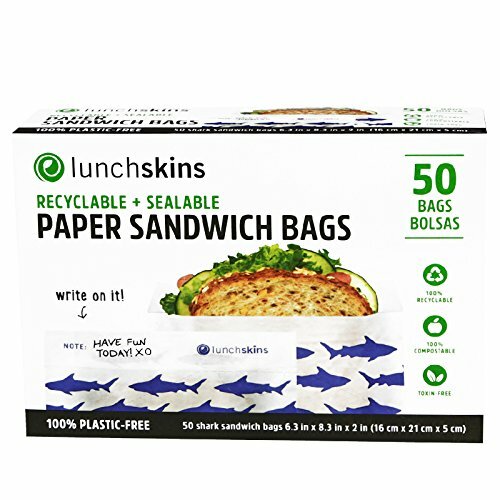 Finally...a disposable sandwich bag you can feel good about using! Perfect for: sandwiches, snacks, treats and much more. Box designed to fit perfectly in your kitchen drawer. Remove peel-away strip to seal in freshness. These durable & grease resistant paper bags are 100% recyclable + 100% home compostable. Perfectly sized for all your dry food storage needs at home or on-the-go! 50 bags per box Box designed to fit perfectly in your kitchen drawer 100% Plastic Free 100% Recyclable + Home Compostable (upon removal of peel-away strip) Remove peel-away strip to seal in freshness Moisture & grease resistant Complies with FDA food safety standards Toxin-Free & BPA-Free Patent pending stay fresh design & biodegradable/recyclable adhesive strip Durable & perfect for: Sandwiches Dry Snacks Baked Goods Picnics Gifts Crafts Party Favors and more.... Keeps food fresh Pleated sides for more roomy storage Personalize your lunch with a handwritten note Bag Dimensions: Open: 8.25 H x 6.25 W (side pleat 1.5 D) | Closed: 7.25 H x 6.25 W"
Choice Marts Merchandise bags have a superior gloss and are Top-notch. Perfect for return gifts,party favors,garage sales, kids party and clothing supplies. Great shopping bags for small gifts,goodie bags,candies,books,DVD's,reading material,clothing,jewelry,novelties,accessories,store supplies,exhibitions and so on. Amazing small colorful gift bags for salons,botiques,convenient shops,speciality stores and all occasions and giveaways. Your guests and customers will appreciate the great quality. 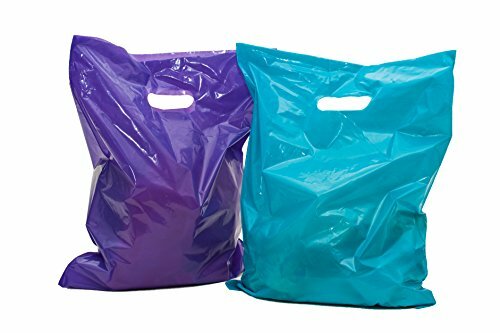 16x18 Extra thick glossy purple and teal blue low density, wholesale plastic merchandise bags perfect for retail, trade shows, garage sales, goodie bags for party or weddings. 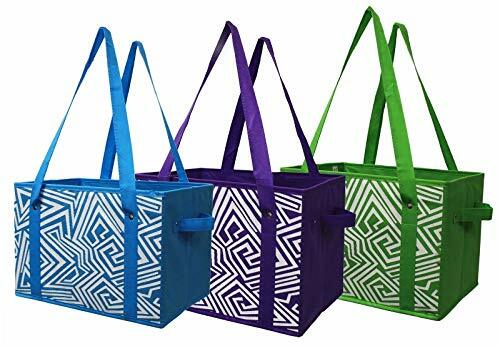 Total of 100 retail merchandise bags with handles - 50 purple and 50 teal blue glossy shopping bags with handles (die-cut), 16"x18", No Gusset, Strong 1.25 Gauge. Low density retail merchandise bags plastic, strong and durable, and the die-cut carrying handle makes them very user-friendly. Reusable shopping bags, recyclable and made with regular low-density plastic material. Buy now because you care about your customers and want them to have a memorable shopping experience. 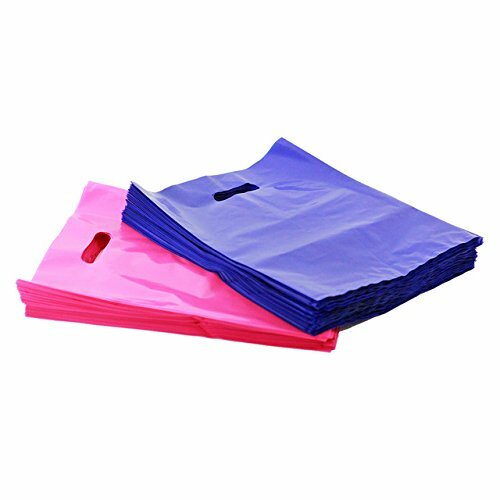 EXTRA THICK AND TEAR RESISTANT, COMFORTABLE AND EASY TO USE: 100 MERCHANDISE BAGS - 50 teal and 50 purple glossy plastic bags with handles, 16x18"
HIGH QUALITY MANUFACTURED PLASTIC RETAIL BAGS, NOT FROM CHINA LIKE OUR COMPETITORS, DURABLE LDPE, 1.7 ml Gauge, No Gusset, 100% RECYCLABLE, REUSABLE AND ECO-FRIENDLY. BEAUTIFUL & COLORFUL: These retail merchandise plastic shopping bags are for larger items-- We have the size and color combination you need! You will love our Grocery Box Bags because they can each hold as much as 3 plastic bags and they stay open and upright for easy loading compared to ordinary floppy, shapeless bags. These bags fold up flat when not in use so you can keep them anywhere, including your car, trunk or kitchen drawer. These bags easy to be environmentally friendly and eliminate thousands of plastic bags. MULTIPURPOSE PAPER BAGS. Size:8"x4.75"x10.5". 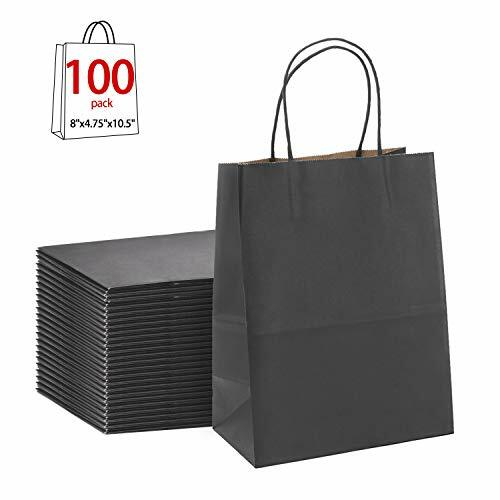 These plain black gift bags are a wonderful medium size for any number of things.The craft paper bags are great for holiday.It's the best choice of gift bags, shopping bags, goodie bags,retail bags, mechandise bags and wedding welcome bags. STRONG and Versatile Bags: These retail bags are made with thick plain black kraft paper and have a strong rope handle. 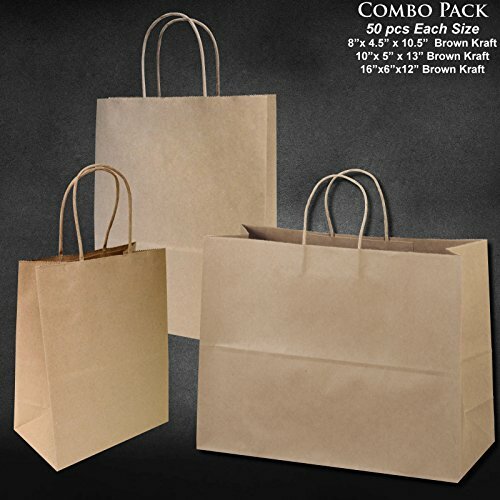 They are strong and sturdy paper bags that can carry at least 2.2lbs of weight easily. The box type bags have a flat bottom so the black bag can stand well. DURABLE DIY PAPER GIFT BAGS:These black bags are perfect for craft and DIY. They are plain black and can be painted, printed and embellished as you may wish. Personalize the kraft bags to make them uniquely yours. Print your own business logo and use them as retail carry bags. ECO-FRIENDLY RECYCLED BAGS: Halulu bags are made with an eco-friendly biodegradable material. These bags can be recycled, reused and composted. 100% SATISFACTION GUARANTEED: We never want to make our valued customers disappointed. If ther's any reasons you're not completely satisfied with our black paper bag, return it for an exchange or a refund. Get your pack of 100 bags now! Merchandise Bags: ACME Bag Bros 50 Large, Extra Thick hot Pink Glossy Retail"Thank You" Merchandise Bags with Handles 12" x 15"
"Thank you" bags: 12" Width X 15" Height, glossy hot pink wholesale merchandise bags for retailers,low density, plastic bags with handles. Plastic retail bags perfect for events, trade shows, small retail stores, parties, weddings, garage yard sales, birthdays, boutiques, goody bags, party favors, gift bags, shopping bags, merchandise and retail bags. Total of 50 retail merchandise bags with handles - say "Thank you" to your customers for their business! 12"x 15", No Gusset, 1.7 extra thick Gauge. Low density retail plastic merchandise bags are strong and durable, and the die-cut carrying handle makes them very user-friendly. Reusable shopping bags, 100% recyclable and made with low-density plastic material. Buy now because you care about your customers and want them to have a memorable shopping experience. Our colorful glossy merchandise bags are great for small gifts, goodie bags,candies,books, DVD's, reading material,clothing, jewelry,novelties,accessories,store supplies,exhibitions and trade shows. These shopping bags with handles are also perfect for return gifts, party favors,garage sales, kid's parties, salons, boutiques,convenient shops, retail stores, specialty stores and all occasions and giveaways. Shop ACME Bag Bros for the best in Shopping & Merchandise Bags, T-Shirt Bags, wholesale merchandise bags, plastic merchandise bags, wholesale plastic bags, wholesale retail bags, retail merchandise bags. 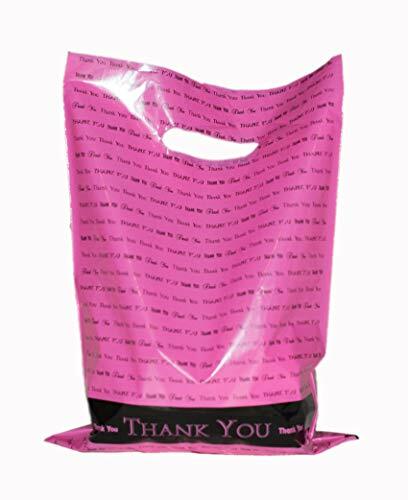 COMFORTABLE AND EASY TO USE: 50 MERCHANDISE "THANK YOU" BAGS WITH HANDLES - Hot Pink Thank You bags, with die-cut handles, 12x15"
EXTRA THICK, HIGH QUALITY, THANK YOU GIFT BAGS, DURABLE LDPE, Plastic Merchandise Bags, 1.7 Gauge, No Gusset, 100% RECYCLABLE, REUSABLE AND ECO-FRIENDLY. 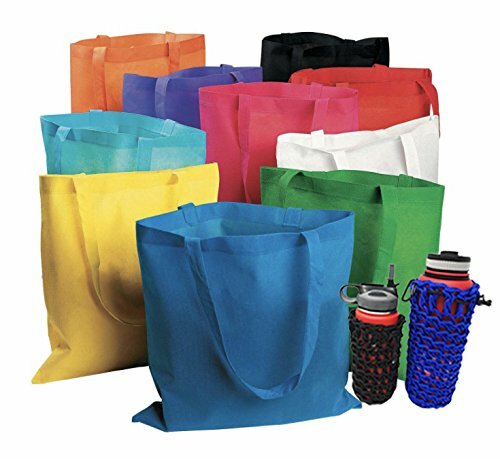 BEAUTIFUL & COLORFUL: These retail merchandise bags plastic shopping bags are for larger items-- We have the size and color combination you need! 16x18 Extra thick glossy black and white low density, wholesale plastic merchandise bags perfect for retail, trade shows, garage sales, goodie bags for party or weddings. Total of 100 retail merchandise bags with handles - 50 black and 50 white glossy shopping bags with handles (die-cut), 16"x18", No Gusset, Strong 1.25 Gauge. Low density retail merchandise bags plastic, strong and durable, and the die-cut carrying handle makes them very user-friendly. Reusable shopping bags, recyclable and made with regular low-density plastic material. Buy now because you care about your customers and want them to have a memorable shopping experience. 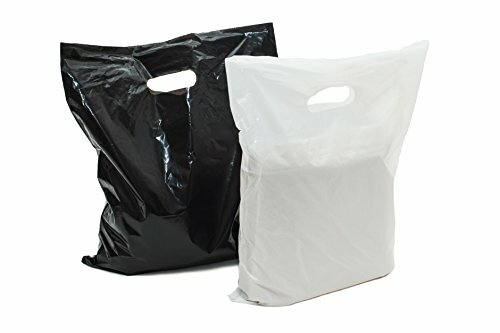 EXTRA THICK AND TEAR RESISTANT, COMFORTABLE AND EASY TO USE: 100 MERCHANDISE BAGS - 50 black and 50 white glossy plastic bags with handles, 16x18"